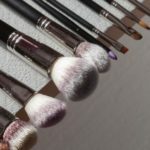 Everyone has a routine for putting on our makeup but have you thought about a routine for cleaning your makeup brushes? They usually contain the most bacteria and can contribute to skin break out. Wet the makeup brush with lukewarm water. Place a small amount of makeup brush cleaner in a clean glass container. Then manage the damp brush with your hand to get all of the makeup out (over the sink). Then rinse the brush in lukewarm water. Be sure to only wet the bristles in this process and not the handle of your makeup brush. If your brushes are extraordinarily dirty repeats steps 2-4 until clean. Dry your brushes with a clean towel. Reshape brush with your hand. 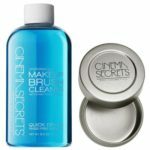 Cinema Secrets Makeup Brush Cleaner cleans makeup brushes instantly without a drop of water is fast drying and conditions your brushes. The powerful cleaning agent dissolves away all traces of creams, pigments, and waxes from synthetic and natural bristles. Dip brush a quarter of the way up the brush bristles. Dip brush tip into the liquid and remove immediately to avoid oversaturation. Wipe clean with absorbent paper towel or cloth. Shape brushes and allow to air dry completely before use. If you are looking to update your makeup brush collection check out our amazing line of Motives makeup brushes.